Let’s face it; wireless performance really is personal. How many of us have selected a carrier based on vague coverage maps, only to learn that we can’t get a signal in our home office or receive an important email while multitasking at our child’s soccer game? How about trying to catch up on the latest episode of “Game of Thrones” in the dentist’s waiting room or watch a live broadcast of play-by-play Giants action while you’re at the game? 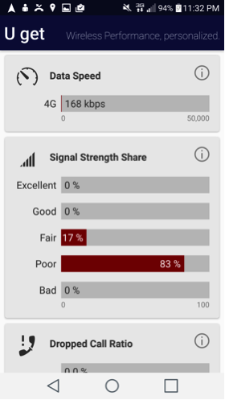 Real live network tests show that the speed and technology share customers get vary significantly, even within the same network. 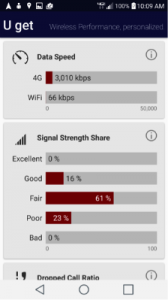 So how do average customers know if they’re actually getting the quality, speed and reliability wireless carriers promise? P3 has the answer. It’s a new free app called “U get” and it does just that. It runs in the background on your smartphone, collects data anonymously and analyzes network performance. 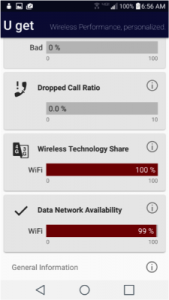 It shows exactly what speed, signal strength and share of the 4G network you’re getting at any time, in anyplace. Oh, and it tracks dropped calls too; but, unless you’re traveling in fairly remote areas, today’s advanced networks have made those a thing of the past. To be completely transparent, I work with P3 and have been involved in recent announcements about the U get app. 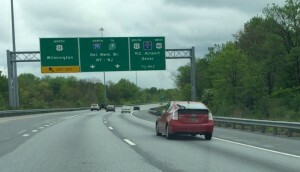 That’s why, when I embarked on my seasonal road trip to the Jersey Shore from my home in Naples, Florida in early May, I thought it would be interesting to put U get to work during the three-day, 1,400-mile trek. The features necessary to collect U get metrics are not available on iOS, so currently U get works only on Android devices. For this trip, my device of choice was an LG VS985 4G LTE and my carrier was Verizon Wireless. My methodology involved activating Google Maps and running it throughout the trip. I captured my progress in screen shots taken at regular intervals and reset the app after each stop. 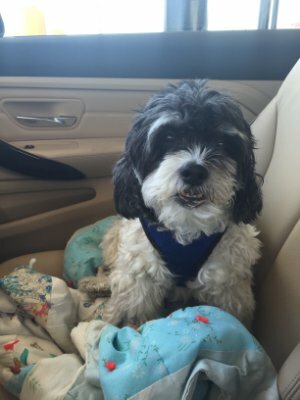 My trusty assistant and co-pilot was Elvis — my 12-year-old Cockapoo. 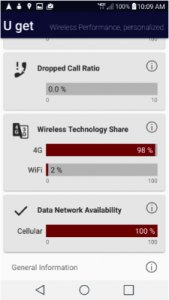 Please keep in mind that this “study” is based on just one device, on one network, running only Google Maps throughout the trip, so my little experiment presents just a snapshot that cannot be considered representative of the average user experience. Overall, however, I found the U get app simple to use, providing a great view of my cellular environment. 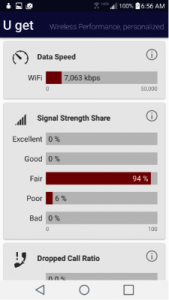 These first screen shots capture the readings at the very start of my trip – in my garage – where I was still covered by my home Wi-Fi, courtesy of Hotwire Communications. 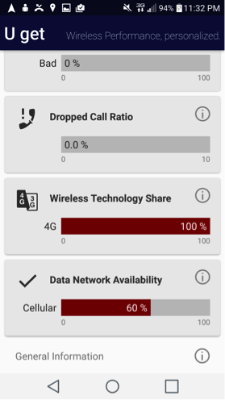 On I-75 north, three hours later in Florida’s Gibsonton/Riverview area, I had strong 4G coverage and had apparently latched onto a bit of Wi-Fi from the surrounding area. Data speed was less than half that provided by my home Wi-Fi network, but certainly sufficient for running Google Maps. By the time we stopped at the Cracker Barrel at Exit 350, just south of Ocala, signal strength was even better, though data speed took a bit of a dive. Once again, no noticeable difference in our desired usage of the phone. 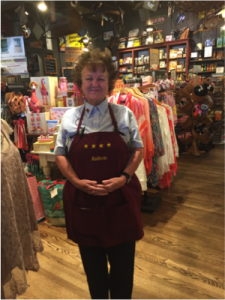 We picked up an audio book from the very helpful sales associate “Ballarie” and were on our way. 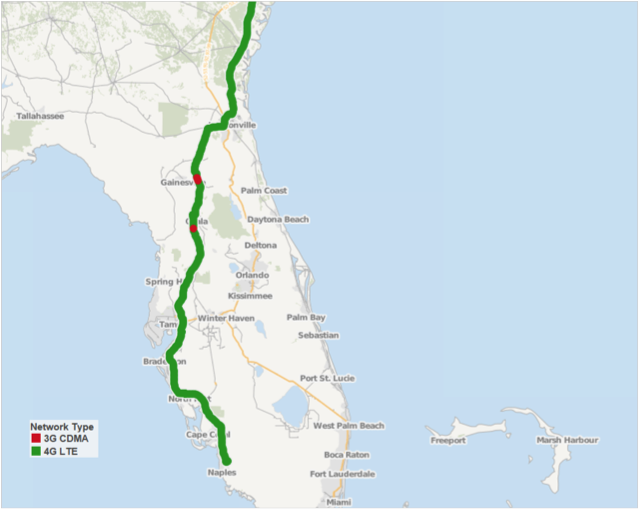 Verizon delivered the 4G connections promised as we traveled north along major roads through the remainder of Florida, except for short stretches of I-75 in Ocala and Gainesville, shown in red on the map on above, which was provided by the P3 insight team and not a standard view of the U get app. Heavy traffic could have contributed to the fallback to 3G CDMA in these areas. 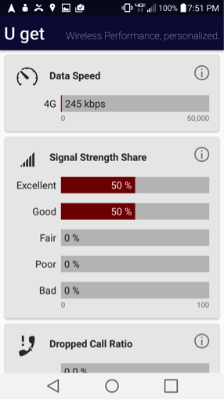 Solid 4G coverage continued through Georgia and into South Carolina. Our 4G signal was very strong when we made our first overnight stop to visit a friend in North Myrtle Beach. The signal was diminished, however, inside her second-floor townhouse, as you can see in the screenshots to the right. 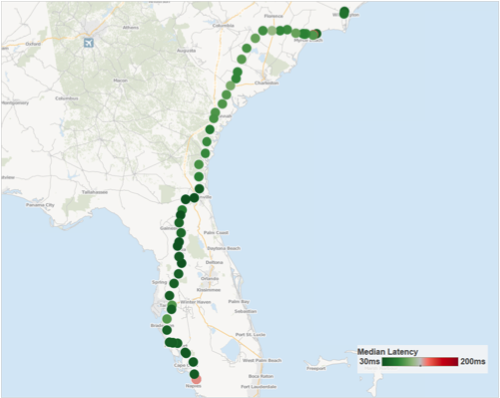 Day 2 of the road trip took us from North Myrtle Beach, through a number of small coastal Carolina towns where we fell back in both signal strength and technology in a few spots. The signal strengthened as we moved into Virginia and continued to improve as we traveled through Richmond and Fredericksburg toward Washington, D.C. and our second overnight stop. Unlike an average U get user, I gave the P3 insight team in Aachen, Germany permission to dig deeper into my wireless usage, as well as to analyze the kind of detailed data they provide to carriers interested in app-based customer experience management. P3’s app-based measurement framework can collect more than 500 parameters on customer Android devices, allowing for unprecedented customer-specific insights. 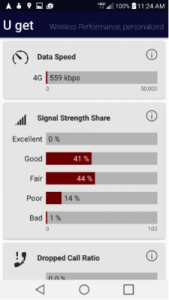 In addition to measures like throughput and latency, P3 analyzes app-specific performance, data volume, usage frequency and duration in studies like the one published earlier this year to gauge the impact of T-Mobile’s Binge On plan on network quality and video habits of users. They also can collect subjective feedback right on customer devices and currently do so for a number of customers through managed panels. In my case, P3 provided the maps below showing median latency over Day 1 of my road trip and another looking more closely at the last leg of my trip, from Washington D.C. to Manasquan, N.J.
Latency, typically measured in milliseconds, is the time it takes for a source to send a packet of data to a receiver. The lower the latency, the better your experience when using highly immersive and interactive applications, like multiplayer gaming and streaming video. On these maps, the darker the green the lower the latency. Note the slight increase in latency in Washington, D.C. and the even greater slowdown in Wilmington, Delaware and across the Delaware Memorial Bridge. Thankfully, this had no effect on Google Maps, but if Elvis planned to pass the time watching Animal Planet in Delaware, it may have been a problem. 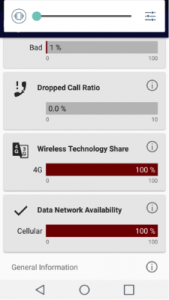 As I said at the outset, the results of my U get road trip show my personal network performance and may not be considered representative of the average user experience. 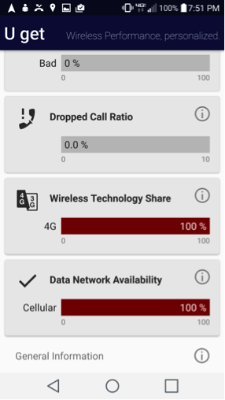 U get is just one of the apps that P3 employs to gather real-time data from thousands of U.S. wireless customers and tens of thousands of smartphone users around the world. Through this strength in numbers, P3 generates the statistically valid data needed to draw insights that allow individual users to select the best carrier for their needs, and help carriers understand and better serve all customers.